The 37th Annual Easter Egg Classic for children age 2-11 will be held on Thursday, April 18, 2019. The gates will open at 1:15 pm; the first run begins at 2 pm. This year's event will be back at Cherry Park in Rock Hill. 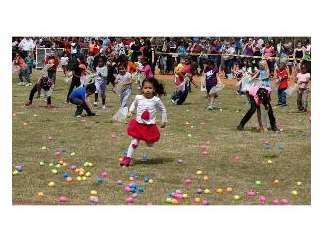 This is a free event that will offer more than 50,000 eggs containing candy and prizes. The prizes will range from Easter baskets to Coca-Cola six packs. The first run will begin promptly at 2:00 pm. Pick up your collection bag as you enter Cherry Park, no baskets or non-official bags. Prizes must be picked up by 6:00 pm on the day of the event. Visit EasterEggClassic.com for more information.